Now, for some other fun...Remember me writing about my tags? Well, up tonight is my Dylusional tag....From Dyan's Dylusions stamps! It was stamped with Ocean Backgrounds and Under The Sea stamp sets and sprayed with some Calypso Teal and Postbox Red Spray Inks. I used two tags and sandwiched them together. First I cut out a window or "aquarium" on one side and added some acetate on the back. 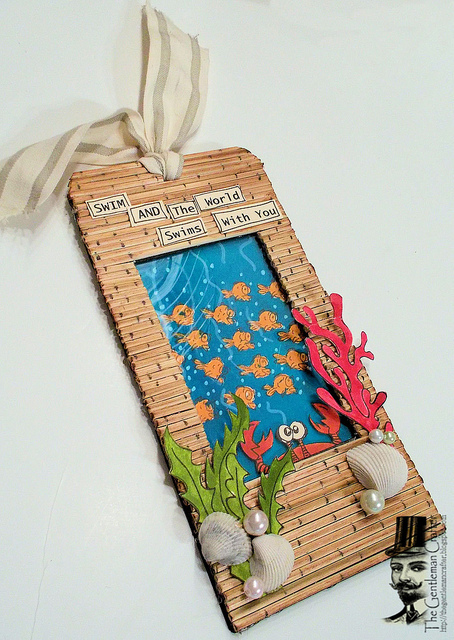 I sprayed the other tag with the Calypso Teal and stamped the fish background stamp. I then colored those in with Squeezed Orange Ink. Next, I stamped out the little crab onto Ranger Manila cardstock and colored it in with the Postbox Red Spray Ink and attached it to the tag where I had adhered the acetate. I added a border of medium weight chipboard to one of the tags to raise it up from the other and adhered the two tags together. Love this- made me smile! Wow, that tag is fantastic!!! Wow! I LOVE LOVE LOVE this tag! So much fun and I am a sucker for sea themed things. Amazing tag Jim, your just awesome! So clever!! I like the look of the skewers... really does look like bamboo. Don't be too hard on yourself... you're so talented! Jim, love this tag! All the work you did to get the skewers on there is so great. Really takes it up to the next level. This truly is Owldorable Jim! I can only imagine the Labor of heARTistic Love. So much FUN and gave me an aha moment :) Can't wait, I'm breaking out my inks. Love this. It is so cute. This is awesome! So fun...and really made me smile. Clever you! Just "discovered" you and am blown away by your talent. Thanks for sharing what you do. Great tag. To make things easier, though, I think I've seen the bamboo in a sheet like that at Pier 1 Imports or other places that sell bamboo placemats. Just a thought. Looking at your dimensions for the pcs cutout for last nights video (which I didn't get to see yet), you have the chipboard at 3 5/8" x 6", but the black CS and PP at 3 3/8" x 6" is that supposed to be correct? Just checking before I make all my cuts. Love your work and always look forward to seeing what you come up with next. Keep up the great job! Thanks for the tutorials. 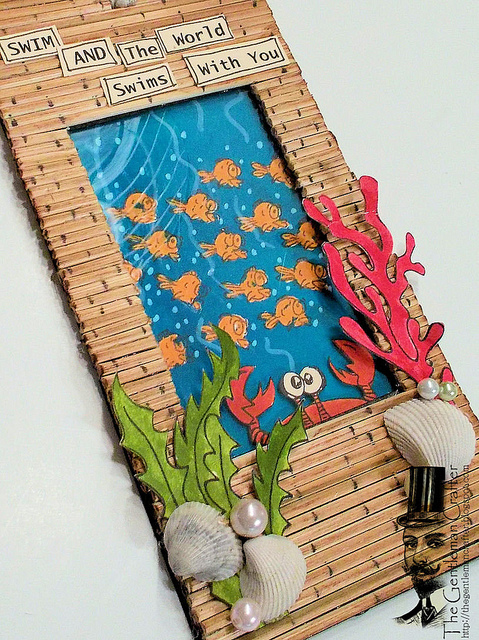 Jim, what a great tag, I love how you made the aquarium effect and the use of the bamboo skewers is genius! Thanks for explaining how you did it. Sorry I had to miss the live u-stream yesterday, I just finished watching the recording. I hope you are enjoying your day off. Sorry for being so late commenting Jim, life has been a little overwhelming here! LOL! I am loving this tag! You are such a clever crafter! Love how you used those bamboo skewers! Have a fabulous week! Well that went under my other google account! Geezzzzzz!